Harold James, a remarkably erudite historian at Princeton and author of The End of Globalization: Lessons from the Great Depression, has a piece at Project Syndicate entitled "The Return of 'Asian' Values," in which he discusses Fujiwara Masahiko's The Dignity of the State (previously discussed here). While James raises interesting questions about the foundations of capitalism, he is mistaken to equate Fujiwara's views with a kind of broader revival of the early 1990s "Asian values" argument — if anything, Asia's powers are learning to beat the West at its own game (isn't that what the outsourcing fear is all about?). No, the significance of Fujiwara is that he is emblematic of Japan's search of an identity in the early twenty-first century — and he is far from alone in his search. The war and the devastation that resulted essentially put these questions to rest for the remainder of the twentieth century. While there was some struggle over Japan's orientation in the 1950s, which resulted in the 1960 eruption of the US-Japan Mutual Security Treaty, the rapid return to normalcy — symbolized by Prime Minister Ikeda Hayato's "income doubling" plan announced not long after the crisis — suggests that fundamental questions of Japan's identity were buried as the void in Japan's values was filled with the desire to get rich, quickly. (I have previously discussed the treaty crisis here and here.) In some ways, the vehement hatred of Prime Minister Kishi and the relaxation of tension that followed his resignation suggests that the outburst had more to do with utterly rejecting the wartime past of which Kishi, a Class-A war criminal, was a potent symbol. (I find the irony of Kishi's signature being on both rescript declaring Japan's intention to go to war against the US and on the mutual security treaty too much to handle.) With Kishi gone, the Japanese could willfully "forget" the past and put off addressing the questions of Japanese identity that lay at the heart of the Great East Asia War/Pacific War. But with prosperity, with success, however, Japan's values crisis has returned, and with each passing year grows more profound. And it is a crisis: there are ongoing debates concerning Japan's relationship with his past, recent and ancient, the relationship between state and society, and the Western/Asian question, and the consensuses that emerge from these debates will have a profound impact on the kind of society Japan is over the coming century. That, of course, is why Abe Shinzo is important. Whatever the political wisdom of his calls to dismantle Japan's postwar regime, constitution included, Abe has dragged the values crisis to the forefront of Japanese life. As this post by Amaki Naoto on a column in Saturday's Asahi by French-educated political philosopher Kayano Toshihito notes, Abe believes that state and people are one, but with the state having a special place due to its monopoly on the use of force. Similarly, he believes that the emperor — as the loom that has weaved the tapestry of Japan — is a dynamic force unifying people and state. Using his bully pulpit to hold forth on his view of Japan's values — with the constitution's civil liberties not occupying a central place in his world view — Abe's legacy may be a deepening of the values crisis. Constitution revision, education reform, historical questions: they all add up to an attempt to resolve Japan's identity crisis by appealing to the pre-1945 past. Abe's solution to coping with modern uncertainty is to bind state and people ever closer and charge ahead, in the process filling the void supposedly created by individualism with nationalism cleansed of associations with the dubious past (because time heals all wounds). 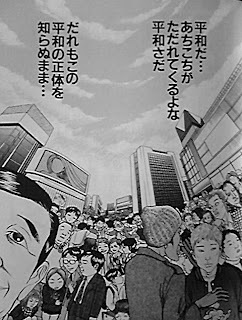 Abe — or more appropriately his advisers and political associates — cling to a softer form of the view of Japan espoused by controversial Manga author Kobayashi Yoshinori (see the image above, a page from the introduction to his massive, three-volume Senro-ron [On War], in which he questions the value of "peace" for Japanese society). Postwar individualism has unleashed havoc in Japanese society, and Japan needs to look to its past to cure these ailments. Fujiwara, Kobayashi, Abe: all facets of the same manner of thinking. Is this manner of thinking appropriate for twenty-first century Japan? Will it actually help Japan resolve its problems and strengthen its position in a changing world? What alternatives are there to this project, and why have they not been better articulated? This problem is particularly acute, because aside from the constitution, what symbols do believers in an alternative have to cling to? That is definitely something that sets Japan apart from Western countries. In the US, for example, there is an established set of symbols — images, documents, words, events — that embody the American "project," to which different political groups adapt their ideas and agendas. Different groups might emphasize different aspects of the canon — early Republicans emphasizing the Declaration of Independence to contrast with Southern Democrats, who emphasized the constitution — but all seek to claim the project's blessing for their own program. Japan, however, lacks a similar set of symbols upon which all can agree. What does Japan have? The imperial system? The constitution? Cultural traditions? There seem to be precious few symbols which liberals can use to articulate Japanese liberalism, and as a result talk of rights seems to sound awkward and foreign. The constitution, for all its supposed "foreignness," is actually one of the few symbols to which Japanese liberals can cling, and now the LDP is set to rewrite it wholesale. As such, this week's book is John Nathan's Japan Unbound, in which he explores various aspects of Japan's values crisis. In particular, Nathan, a biographer of Mishima Yukio, whose novels epitomize the values crisis, provides a fair, critical account of Kobayashi Yoshinori that alone makes the book worth reading. Meanwhile, I leave this question for readers: why is Japanese liberalism so brittle? Nathan's book was one of the first I picked up when I started getting interested in this whole subject. It's an excellent read, and I hope you enjoy it. 1) I think this is Chalmers Johnson's theory, but the Occupation framed the internal Japanese political debate around alignment with the US. This made "Socialism" (and its pro-Soviet message) the obvious counterpoint to "Conservatism" (pro-US) and left no room for old fashion democratic liberalism in the middle. For a long time before that, however, Japanese intellectuals and artist types had an infatuation with Communism and Marxism to a degree that made "liberalism" look not sufficiently radical after the war. 2) The 60s New Left seems like it could have melted down into a softer liberalist movement, but the participants had figured out by the end of the 60s that their protests had absolutely zero impact on the democratic system. And once Asamasanso and the Lod Massacre happened in 72-73, all "Leftism" went on the outs. Can anyone say straw man? "No comment" — too little, too late? Is that a prediction or a threat? What grades will Abe bring home at term's end? What would a liberal Japan actually look like? Are we all social democrats now? Death of the 1955 system? Greatly exaggerated. Not a thing to say?